Hyman Saul Lebman, aka H. S. Lebman, a San Antonio, Texas gun dealer first came to the attention of FBI, San Antonio as a result of gangster Tommy Carroll participating in the murder of a detective there and the wounding of another in 1933. Unknown to law enforcement at that moment, Carroll had been in and out of San Antonio with "Baby Face" Nelson (Lester Gillis) for six months prior. Also unknown was Lebman's real involvement. All of that was about to change. 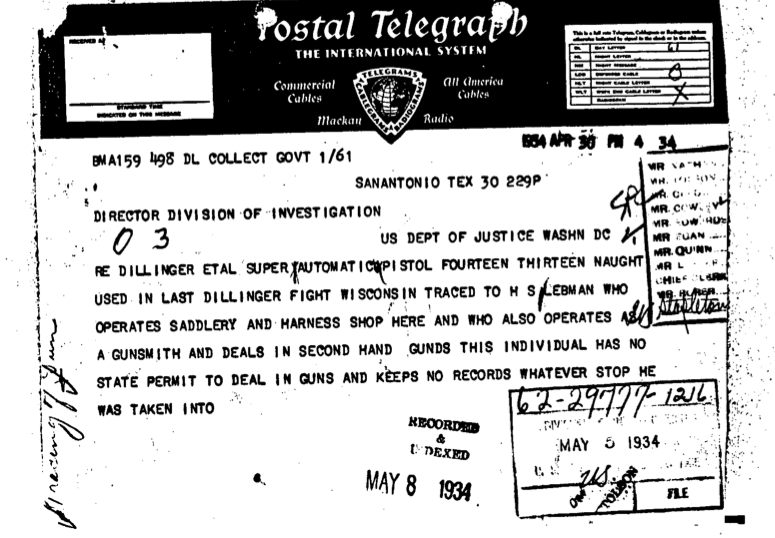 Lebman's role with supplying firearms to the likes of Nelson and his crew, beginning in about June, 1933, turned into an extensive investigation with regard to Lebman's possible illegal sales to them, and the travels and activities of the Nelson and the Dillinger gangs throughout Texas and beyond. Lebman had been obtaining some of his firearms from Wolf & Klar in San Antonio, Texas and then altering them for resale to gangsters. He had also been obtaining Thompson SMG's from one John Stockmeyer. (In a separate incident, we do know that Lebman supplied a Thompson SMG to the wife of "Machine Gun" Kelly.) Although Lebman never mentioned it to the FBI, it is believed by many gang enthusiasts that Nelson was referred to him by midwest bank robber Eddie Bentz of California, an early Nelson crony. If we look at the meets between Lebman and the Nelson gang we don't see any appearance of Dillinger and his group Lebman (or Texas) during that period of June, 1933 to December, if at all. Between June, 1933 and March, 1934 both gangs appear on a "timeline" to be running parallel to each other although granted they may have run into each other at local haunts. No doubt where Dillinger gets linked to Lebman is through the media craze of the post Bohemia shooting which occurs a month later followed by Lebman's admissions (which are made public) with regard to Nelson and Carroll, both of whom are at Little Bohemia. The media and law enforcement obviously figured that Dillinger added several more members to his gang, i. e. the Nelson side and this all must be the "new or second Dillinger gang." Needless to say, Nelson surely didn't see it that way nor did Dillinger. Most would probably agree that Dillinger was very "uneasy" about Nelson. According to Lebman, it was Tommy Carroll who purchased the altered Colt super. 38 auto that ended up found at the scene of the Little Bohemia shootout in April, 1934. He had gotten this from Lebman along with other firearms during the October, 1933 period. Investigation revealed that Tommy Carroll had used the address of Joseph Bennett in St. Paul, Minn. to ship some of the guns obtained from Lebman. Bennett was the brother of Tommy's wife, Sally Bennett, aka "Radio Sally." Nelson and others had been to this residence, and it was a note to Lebman, found by FBI SAC Gus Jones, that revealed this to be the "weapons drop" of the gang. Minneapolis police then attempted to arrest Carroll at this residence, but he escaped leaving a Thompson SMG and more behind. Nelson and the others spent Thanksgiving of 1933 with the Lebman's and the last time Lebman saw Nelson or any of them is December, 1933 according to his statement. In addition to the Bohemia finding, Lebman guns surfaced at other locations, a few were found in his shop during interrogation, and no doubt a few are lost to history. During the December 1933 period Carroll and others are in San Antonio, he ends up involved in the fatal shooting of a San Antonio detective, H. C. Perrow, and the wounding of detective, Al Hartman. In that case, Lebman let Carroll use his shop to change clothes after the shooting. Carroll escaped San Antonio, and there was no evidence Lebman had any knowledge of Carroll's murder and wounding of the officers. In the meantime, Nelson fled to California. (Carroll would be killed by police at Waterloo, Iowa in June, 1934). All in all, Lebman's ordeal with the Nelson gang did not result in any violations of federal law and his prosecution was turned over to the state of Texas. Despite the fact that he was initially convicted, Lebman's entire case involving violations of the Texas Machine Gun statute was reversed in Texas courts. He never served a day in prison. For readers, it is suggested these initial reports on the Lebman investigation with Nelson et al be examined. 1. FBI SAC, Gus Jone's intial report to Hoover on the Lebman contact. We also suggest readers check the articles in our navigation area and read those submitted by T. J. Mullin and Kevin Williams. Lebman and his gangster relationships mentioned are seen in a variety of books in print about the era. Note: In the interest of clarity, the Bureau is referred to as "FBI" during the above 1933 - 1934 period, however it is known that the official name was not adopted until 1935.